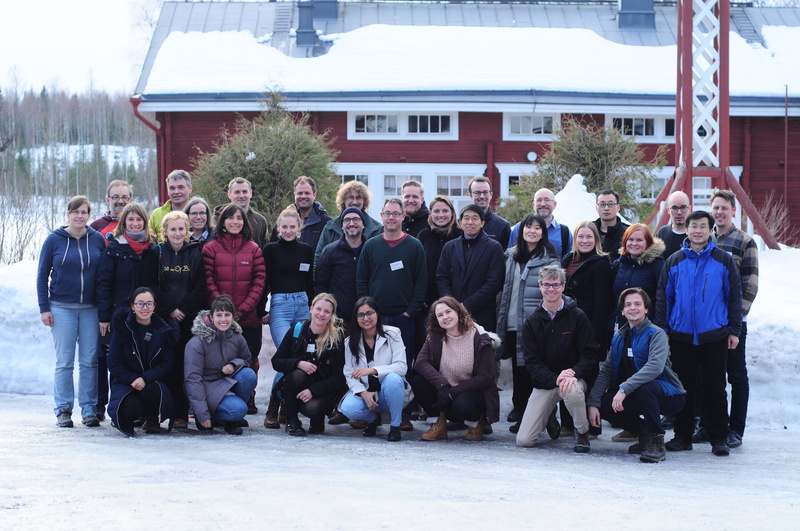 During February 25-March 1st OPL hosted the 1st FAST Workshop (Fluorescence Across Space and Time) in Hyytiälä Forest Station. A total of 35 participants from 10 different countries and from very diverse backgrounds (from nanosciences to global land surface modelling) joined the Workshop to discuss and brainstorm on current challenges and opportunities of SIF across scales. Thank you all for making the effort of coming to Hyytiälä! We hope we can turn the outcome of the Workshop into an Opinion paper, so stay tuned! 1) Paulina recently published her first article “Leaf-level spectral fluorescence measurements: Comparing methodologies for broadleaves and needles” (DOI:10.3390/rs11050532). In this study we compared three different methodologies for measuring reflectance and fluorescence of leaves and (especially) needles! We argue that needle mats, despite of potentially enhancing red fluorescence reabsorption, are an advantageous solution to track the seasonal changes in fluorescence spectral properties of needles. 2) Hyytiälä was probably (“one of” or “the”) first site to start monitoring canopy spectral reflectance and solar-induced fluorescence (SIF) back in 2010 with Dr. Caroline Nichol from the University of Edinburgh. A few years later, we are very happy to see the first SIF article published “Diurnal and seasonal solar induced chlorophyll fluorescence and photosynthesis in a boreal Scots pine canopy” (DOI: 10.3390/rs11030273). The paper reports only a modest correlation between SIF and photosynthesis for the evergreen forest. Inherent challenges are discussed and a new scheme for SIF normalization introduced. Welcome Dr. Shari Van Wittenberghe! Shari recently joined OPL as a visiting scientist and will stay with us for the next year as part of her Postdoctoral Fellowship (See Who we are section). Among other things, Shari will be investigating the mechanisms that control the short-term responses of reflectance, transmittance and fluorescence in leaves with different states of down-regulation. This entry was posted in Yleinen by Paulina A Rajewicz. Bookmark the permalink.